No one would mistake the hockey gods treatment of the Philadelphia Flyers this season as hospitable, but what they did on Draft Lottery night was just cruel. Even after the conclusion of a season marred by inconsistency and some plain bad luck, the Flyers received more bad news. Not one, but two Metropolitan Division rivals, the New Jersey Devils and New York Rangers, struck gold at the NHL Draft Lottery. They will pick No. 1 and No. 2 overall, respectively, at the 2019 NHL Entry Draft on June 21. Ouch. For good measure, the Chicago Blackhawks, originally slated to draft 12th overall behind the Flyers, also jumped into the top three, pushing the Flyers back one slot from 10th to 11th. Frank Seravalli of TSN reported that the Flyers actually had a 27 percent chance of winning the lottery prior to the final lottery ball, the second highest chance of any team behind the Devils. Here's where it gets fun. #NHLDraft lottery balls came out 12-4-2. That left 11 possibilities for final ball. #njdevils had 4 of them (36%). Interestingly, #Flyers also had 3 of them (27%). VAN, NYR, COL and LAK each had one. Winning combo was 12-4-2-10. So, so close. A jump to No. 1 overall could have landed the Flyers Jack Hughes, the impact center they desperately crave. Instead he’ll be heading up I-95 to either Newark or New York. Other than lottery balls being mean to the Flyers, they’ve met a few more bumps in the road. In the Flyers’ exit interviews, general manager Chuck Fletcher outlined some of the checkpoints on the organization’s to-do list. One of the first points on that list? The head coaching position. 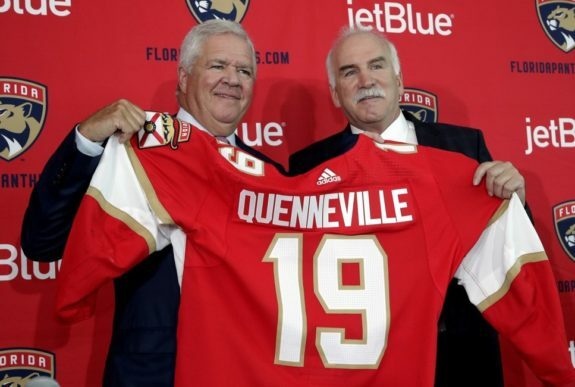 It’s no secret that Flyers’ brass had their eyes set on acquiring Joel Quenneville, the three-time Stanley Cup champion and future Hall of Fame head coach who was relieved of his duties by the Blackhawks earlier this season. The Flyers still have plenty of veteran head coaching options that can potentially fill the position, they just won’t be taking home of the belle of the ball. Some options on the table going forward are Gordon, Dave Tippett, Alain Vigneault, Darryl Sutter, and Sheldon Keefe to name a few. 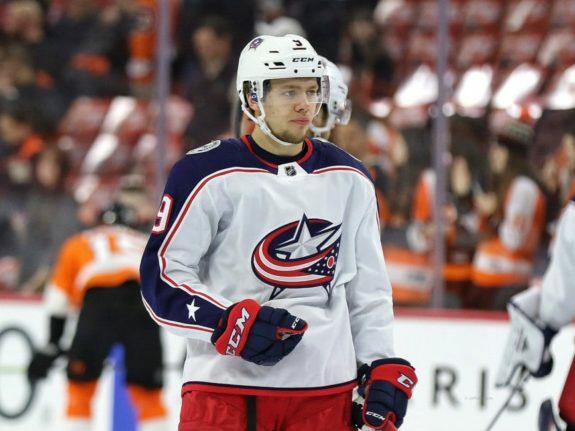 Back in February, Bob McKenzie suggested on Ottawa’s TSN 1200 that the Panthers could be clearing cap space to take a shot at signing both Artemi Panarin and Sergei Bobrovsky this offseason. Quenneville’s signing with the Panthers may have given them a leg up on the competition in regards to signing Panarin. Quenneville coached Panarin through his first two season in the NHL as a member of the Blackhawks. The chance to play for his former coach could be an enticing prospect. This also serves as an extra road block for the Flyers in terms of convincing him to bring his services to South Philly. Fletcher wants to be aggressive this offseason in adding talent, so Panarin figures to be near the top of his wishlist. He’ll have his work cut out for him trying to lure him to the Flyers. Although the Flyers have dealt with some early adversity in their quest to re-work the roster into a contender, all hope is not lost. There are still respected coaches left unemployed and although their chances may have diminished, Panarin is still a possibility. The Flyers still have other avenues with which to improve the roster including the trade market and a restricted free agent market ripe with talent such as Mitchell Marner and Brayden Point, but their margin for error has shrunk. If they strike out on the free agent market and don’t improve the roster in another fashion, it’s going to be tough to keep pace with the rest of the Metropolitan Division. No one said this process was going to be easy, the Flyers and Fletcher are learning that fact early into the offseason.